How to Convert AVI to iPhone Format to successfully Play AVI on iPhone 5S, iPhone 5C, iPhone 5, iPhone 4S, iPhone 4, iPhone 3GS, iPhone 3G? With the debut of the new iPhone 4S, 1080p HD video has become one of the hottest topics: The 8MP camera with all-new optics shoots 1080p HD video; the new released iPhone 4S also support HD 1080p video playback. However, this new iPhone 4S only supports play backing 1080p in MPEG-4, H.264 or Motion JPEG (M-JPEG) video format. If you want to play 1080p AVI on iPhone 4S, it will still end in fail. How wonderful if we can play AVI on this new iPhone 4S. This following article aims to share a step by step guide on how to convert AVI to iPhone 4S supported MPEG-4 or H.264 so as to successfully play AVI on iPhone 4S or play 1080p AVI on iPhone 4S. It also helps to convert and play AVI on iPhone 5S, iPhone 5C, iPhone 5, iPhone 4, iPhone 3GS, iPhone 3G, iPad, iPod, iTunes, Apple TV and etc. 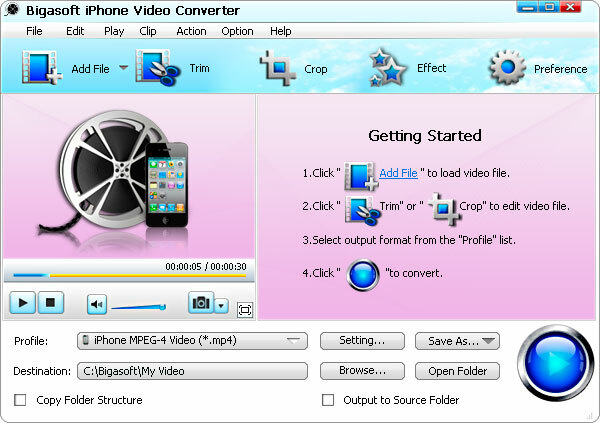 Free download this powerful AVI to iPhone 4S Converter - Bigasoft iPhone Video Converter (for Windows, for Mac), install and run it. 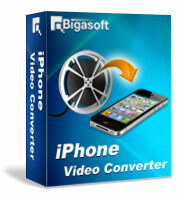 Bigasoft iPhone Video Converter, the professional AVI to iPhone 4S Converter, is specially designed to help iPhone users to enjoy all kinds of video and audio on iPhone 5S/5C/5/4S/4/3GS/3G. It can easily convert AVI to iPhone 4S MPEG-4 or HD H.264. Besides, it also support converting other videos including WMV, ASF, MKV, MPG, VOB, MTS, F4V, WebM, WTV, 3GP, FLV, MVI, BIK and more to iPhone format for playing on iPhone 5S, iPhone 5C, iPhone 5, iPhone 4S , iPhone 4, iPhone 3GS, and iPhone 3G. Moreover, this powerful AVI to iPhone 4S Converter is equipped with advanced video editing function like merge videos into one, trim and crop video, adjust audio volume, rotate video, add audio track and subtitle for video, increase artistic effects for video, add image or text watermark for video, split video, and more. Click "Add File" button to import AVI files to Bigasoft iPhone Video Converter. To play SD AVI on iPhone 4S: Click the drop-down button on the right side of the "Profile" to select iPhone MPEG-4 Video (*.mp4) as output format from "iPhone" category. To play 1080p AVI on iPhone 4S: Select MPEG-4 HD Video(*.mp4) from "HD Video" Category. To crop unwanted video part or remove black edge of your AVI movie, you may refer to "Crop" function. To rotate videos, add subtitles and audio tracks to videos, add custom text and image watermark, adjust video brightness, contrast and saturation and add effects to video and more, you may refer to "Effect" function. To set preferred output video folder, output snapshot folder, image type, after conversion done action, CPU usage etc. you may refer to "Preference" function. Click "Convert" button to finish converting AVI to iPhone 4S supported format. Connect iPhone to computer, start iTunes, and then import the converted AVI to iTunes for sync AVI to iPhone 4S. With this powerful AVI to iPhone 4S Converter, it is just easy to play AVI on iPhone 4S/4/3GS/3G or even play AVI on iPhone 5, iPhone 5S, and iPhone 5C, play customized AVI on iPhone 5S/5C/5/4S/4/3GS/3G, or even play 1080p on iPhone 5S, iPhone 5C, iPhone 4S, iPhone 5, iPhone 4, iPhone 3GS, iPhone 3G. Wait no more; just download this powerful AVI to iPhone 4S Converter for a free try.